Its Friday! We survived the first week of school! How did you make out? I spent the majority of the week feeling hung-over from a wild night of partying, except its day time, I went to bed at a respectable time each night, and there was no partying. LOL. In addition to getting back into the swing of things, I’ve resumed walking again (took like a one year hiatus, because…kids. Also because I couldn’t afford the gym membership to our leisure centre.) And, I am not disciplined enough to work out at home. Tried it. So, while I missed walking terribly, my body is having a difficult time adjusting to the busy days (how is it that life is busier without kids around?) and occasional busy evening, too. I’m looking forward to sleeping in tomorrow, and making my kids get out with me for a walk. Famous last words. I’ll let you know later how that works out. I shared a blog post a couple days ago about our inks and the transformation they’ve gone through, as well as the new storage options we have for CTMH inks. I thought today I’d share with you what the stamps look like. Over the years, they’ve transformed, too, from wood mounts to acrylic. I realized some of you may not know what the difference is between the stamps (there’s different varieties out there), and what you’re supposed to do with them. I still have a lot to learn about stamps and stamping in general, but I’ll share with you what I know about the basics and CTMH’s specific brand of stamps. First and foremost, you’ll notice when you look at a stamp set, that it lives in a 6×6 inch pocket. The pocket has a Charcoal coloured insert inside it with the CTMH logo and what product it is (My Acrylix Premium Quality Decorative Stamps). *Note: on the reverse side of the paper insert are care instructions for your stamps! Caring for cling stamps is so simple. When you notice that the clinginess is gone, and your stamps tend to want to fall off the protector sheet, rinse them under your kitchen tap. It’ll restore the stickiness, and you’ll be ready to continue stamping! Its as easy as that! Also, its important to clean your stamp after each use, using the stamp cleaner and scrubber (available on my website, as well). You’ll prolong the life of your stamps, and keep them looking new longer! Some inks (especially dark ones, such as Basic Black or Peacock) will stain. Don’t worry about that. As long as you’re cleaning them within a reasonable amount of time, your stamps will not be damaged. Cleaning also helps prevent transferring and mixing of inks). That was a big bunny trail. Sorry about that! Back to the insert, now. There’s contact information on the insert, as well (Pinterest, Twitter, etc). You’ll notice that there’s one of two types of enclosures on the pocket. The type of enclosure you see is going to determine how old the stamp set is. Previous to the current year (I think the change may have occurred in the early part of this year, or late, late last year), enclosures were button style. The current stamp sets are envelope style. View below. Now, the rounded part of the envelope flap fits inside the slit to keep it closed. This switch was music to a lot of CTMH stamp users’ ears. The button style added too much bulk when it came to storing the stamps. With the flatter, envelope style, more stamps fit inside the storage containers, because they take up less room. Bonus! A lot of consultants (and probably customers alike) removed the buttons after the package was changed in an effort to make more room without spending more money. Now you don’t have to! When you flip the package around, you’ll notice the stamps face outwards so you can view exactly whats in the envelope. You’ll also see in the top right corner the order number and stamp set name. The stamp sets vary in size, so the amount of stamps you see from one package to the next is going to be different. They all are put into a 6×6 inch package, unless you purchase the M sized stamp. They are 3×3 inches, and therefore don’t need such a large package to live in. There’s typically only one stamp in each M size set anyways. All the others- A to E- have multiple icons and images and are housed in this size envelope. When you open the stamp set, you’re going to notice a couple things right away. First of all, there’s a 6×6 sheet of foam that’s included inside the envelope. Keep that, too. Yes, it does have a function, and no, don’t throw it out along with the rest of the envelope! I did that, and regretted it as soon as I realized it was probably necessary to keep. The good news is, extra sleeves are available to purchase on my website should you need them. I’m not sure about the foam insert. So, why do you want to keep that piece of seemingly unnecessary sheet of foam? It isn’t just an extra piece of packaging that should be thrown out along with the bubble wrap when your parcel arrives. That little piece of foam has a very important function, believe it or not! Can you see the foam sticking out from underneath the card? (Spoiler alert- here’s a sneak, sneak peek at an upcoming card for October’s Card Blitz!!) On your work surface, that little piece of foam acts as a cushion for your stamps, so every time you stamp an image on your paper or card, you’re left with a crisp, clear image. This is especially important if you don’t have the Versamat, pictured below. (It serves the same purpose, but is 12×12 inches in size, is self-healing and is marked with measurements at every 0.25 inches for keeping things straight on your projects! I do all my crafting on top of this mat, and use its measurement lines frequently. Its a very handy tool in crafting). The little foam insert is so handy, too! You’ll want to use it any time you stamp! It also prevents the stamp from being squished and damaged during shipping. The spongy texture acts as a cushion while it travels, so when you’re ready to craft, the image is clear and precise. If its flattened, it will not stamp as nicely, or look as good as it could. So, do not throw it out! Secondly, you’ll notice the stamps! Duh! They come on a protective sheet that’s got the same image or icon printed on it, making it easier to see, and making the detail in the image easier to note, as well. Sometimes, the protective sheet will tell you that the image has a coordinating die cut from one of our Cricut cartridges; other times, it’ll coordinate with one of our Thin Cuts. If it coordinates with a Cricut cartridge, the name of the cartridge will be listed in the top right corner. There will also be measurements beside the image that has a sister icon on the Cricut cartridge. When you cut it, the stamped image should fit inside the die cut image. Knowing that my stamping could look neat and professional just by using that little piece of foam (or the Versamat) while I worked was a big confidence booster for me. Now, I like stamping, and I’m not making any more mistakes! Looking like a pro is easy to achieve with one simple step. Who knew?! What else should you know about our stamps? I mentioned at the start of this blog post that they are cling mounted, meaning they are sticky and will stay firmly secured to your acrylic block while you’re stamping. When placing the stamps on your acrylic block, make sure to attach it flat side down, so that the rough side is able to do its job. See below. For a slight change of pace, I have a double page layout to share with you today! I used Jack, once again, but this time paired it with CTMH Oh, Deer complements. Instead of using another paper border along the top of the photos, I opted to stamp it instead. It was a nice change, and I love the final result! (Why do I not stamp borders more often?) I always worry about whether it’ll look good or not, but when I finally give in and do it, I love it! Why worry? It will all work out in the end. Something I like to do when I stamp borders or a linear shape, is using my straight edge ruler to mark a line first. Then, I follow behind with stamping. I know there are fancy tools out there that help you make straight stamps each time, but this method works well enough for me for the time being. I like old school. (For now, who am I kidding? Owning a tool like this would make my heart so happy!) One day I would like to splurge and buy a stamping buddy! Do you have one? I might be the only one that thinks this, but how CUTE is the deer and tree patterned paper at the bottom of the layout? Of all the paper that you find in the Jack collection, this is by far my favourite. I would love to own more of it. But…it isn’t meant to be. Mama needs to make room for all the other beautiful goodies coming out! Tomorrow is that day! The new Seasonal Expressions catalog goes live TOMORROW! I’ll be adding it to my next order. If you’d like one, please message me to reserve it. Lets get back on track. Jack equals perfection when it comes to your outdoorsy, boyish and trendy cards and layouts. Whats your favourite pattern? If you want Jack in your life, I can make that connection happen. You have TODAY to order it; 11:59 PM MST is your last chance to make this a part of your life. If you need it like I need it, send me a message, or visit my website @ http://www.theeverydayscrapbooker.ctmh.ca to order it for yourself. How often do you create sports themed layouts? I haven’t up until this point- because any sports my children were involved in (mostly swimming), required me to be with them, and I wasn’t able to snap pictures. That’s only because they were so young. Now that they’re school age, a whole new world will open up to them- and I’m so excited to explore their interests with them! Skating and soccer werethe first sports we began with. I’ll have to look for pictures of skating…I know one lives on my Facebook. I’ll have to print it the next time I need more pictures. None of us enjoyed soccer. It was more than likely that they were young, but I think my children thrive more in sports that challenge them selves individually, not in a team. They love their gymnastics and swimming. Miss A keeps asking if she can try Tae Kwon Do. I’ve sort of been putting it off, but I think we should explore it. They have a keen interest in music, too. This year (grade 2) enables them to join choir, if they want (Miss M does! ), and we’re contemplating piano lessons in the fall for both twins. There is lots going on! Back when my kids started playing sports, an idea dawned on me that I’ve been sitting on for quite some time. It was to create a mini album of all the sports they are involved in. Or at least, every year of sports they’re involved in. I did begin it, but only have like 1 picture in it. I do believe I’ve run out of the paper I’d originally started to use in it, so when I get back to it, I’ll have to complete it using something else! Unfortunately, I don’t have any pictures of the mini album at the moment. Sorry! At some point during their sports (usually their first lesson, if I remember), I take pictures of them. Swimming is the easiest to get pictures of. Gymnastics is the hardest. (Parents generally aren’t allowed in the gym while the kids have class. They have a showcase at the end of their session where they show off everything they’ve learned. I love it, but it makes picture taking interesting!) There’s also more changes coming to our gymnastics program for this upcoming season…I can’t wait to see what we all decide to offer! (I’m on the board, so I’m privy to the deets, LOL). There’s more to look forward to. I picked up the purple hues in the twins’ soccer jersey’s and pulled it into the rest of my layout. I didn’t have a shade of purple that deep, so instead settled for CTMH Thistle. The Fundamentals in the background matches it perfectly. And, if you notice, for a pop of additional color, I used a strip of sponged card stock I had hanging around on my desk. I also matted the soccer ball onto a piece of it and adhered it to the layout with a pop dot. *Tip: instead of using paper to create a flat border with a punch, why not create a border using words or shapes? In Cricut Design Space, I added the word ‘soccer’ twice- one in a large font, and the other in a smaller font. I hid the larger soccer word from cutting so that I would only cut the smaller one first. Once I got to the cutting stage, I changed the amount of times I cut the smaller word (in this case two times) and then adhered it evenly on the background. To give the border a ‘there, but not quite’ look, keep it the same color tone as the background. I love the white on white effect! 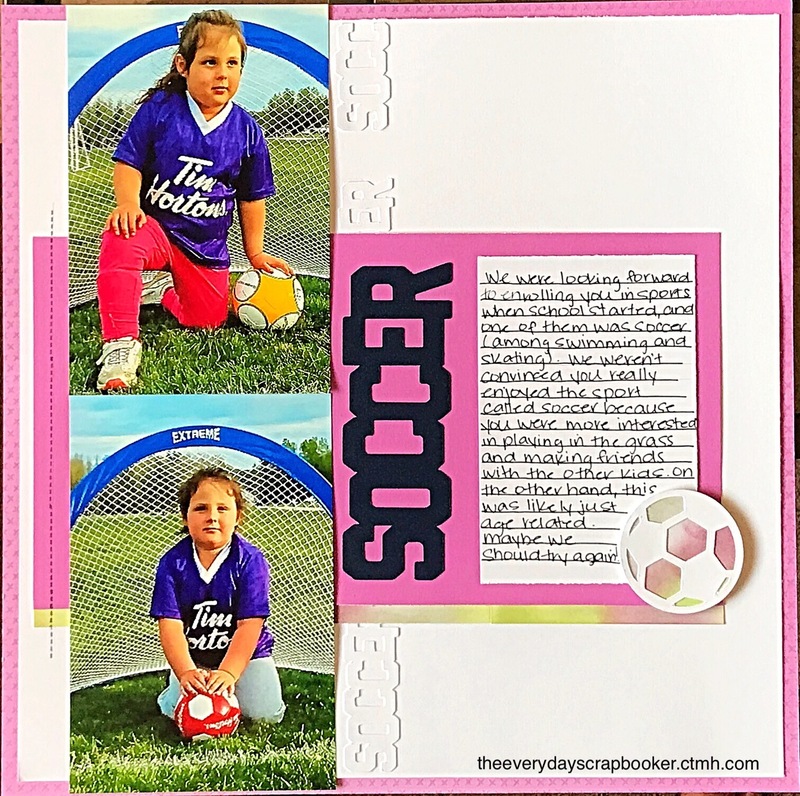 After deleting the smaller soccer word, I cut the larger one from Navy Blue Recollections cardstock, which picks up the color of the soccer net in the background of the pictures. 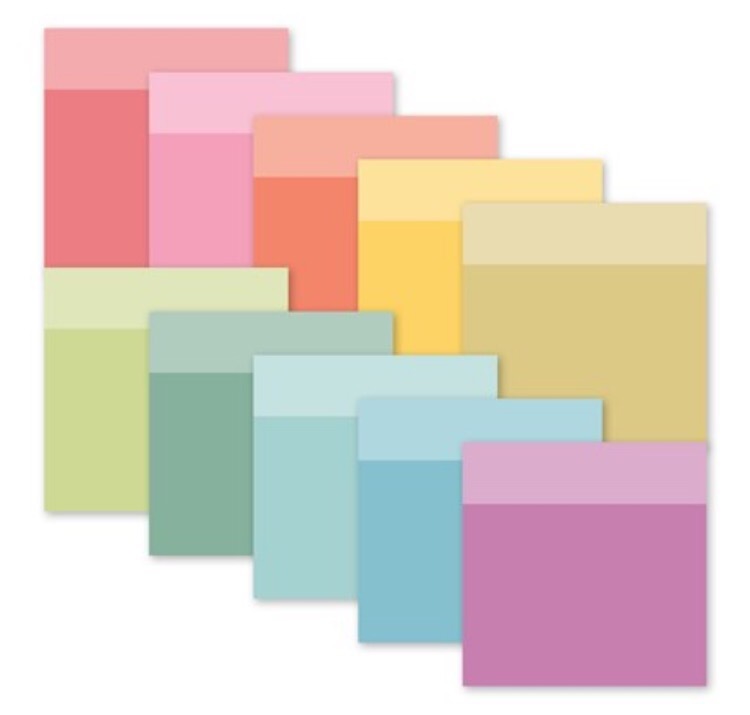 This is the new Whimsy Cardstock Paper Packet. Look at all that deliciousness! This is available to purchase on my website right now! Visit my website here. The new Whimsy Fundamentals Paper packet coordinates with it, as well! There’s more where that came from. Head on over to my website and check it all out. There’s sure to be something you’ll love. And, since I uploaded the pictures from my phone to my computer, that also means whatever projects I had saved to my phone were also transferred to my computer. They were transferred out of order, unfortunately, and as a result, I accidentally shared a layout a bit sooner than I had planned. Minor little accident. I recovered the layouts that had been sent to my trash can on my phone, and will continue adding layouts here from there for the time being. There’ll be less confusion that way. Now I’ll be back to my regular order. I had better get some crafting done…I’m getting low on content to share with you! So, back to Christmas in July. I have this layout and one other about Christmas in April, and then I’ll move on to something else. Do you have a scrap pile that seems to keep growing instead of shrinking? Looking for ways to cull some of that scrap paper stash? Here are 5 ideas that I consistently use in my own crafting that you may find helpful! 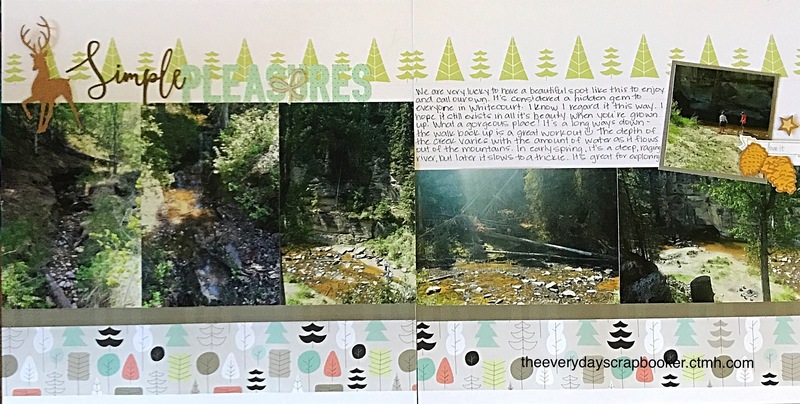 Make your own journalling spots. I most often use my White Daisy card stock for things such as this, but I find that a lot of scraps end up in my box that are a good size for journaling on. (That’s usually about 3×4 or slightly larger). There’s still some room to stamp on the journaling box in addition to your notes. But, don’t limit yourself to White Daisy! Any solid card stock would work! Make your own embellishments. All those scraps are perfect for stamping on, and then fussy cut to your hearts’ content! Use them to create embellishments to scatter around your project, use them to create punched borders, or pennants…the list goes on. In the layout above, you’ll see a star, bracket, flower, presents, and a pennant with a message stamped inside it. Those were all created from my scrap White Daisy papers. Create the illusion your photos are matted. Rather than physically matting your photos on a large piece of patterned paper or card stock, trim it down and adhere it next to your photos. Your favourite papers’ life will be drastically lengthened this way! While it may add more to your scrap box (if the piece of paper you’re using is on the larger side), you’ll still have enough of that beloved paper to use on future projects instead of using it all up (or the majority of it) on one! I used this technique on the layout above. The City Sidewalks paper is adhered on either side of my photos on both pages. Think of them as the ‘book ends’ or brackets surrounding the photos. Use your Cricut! Some of those scraps will be large enough to cut icons or titles from. 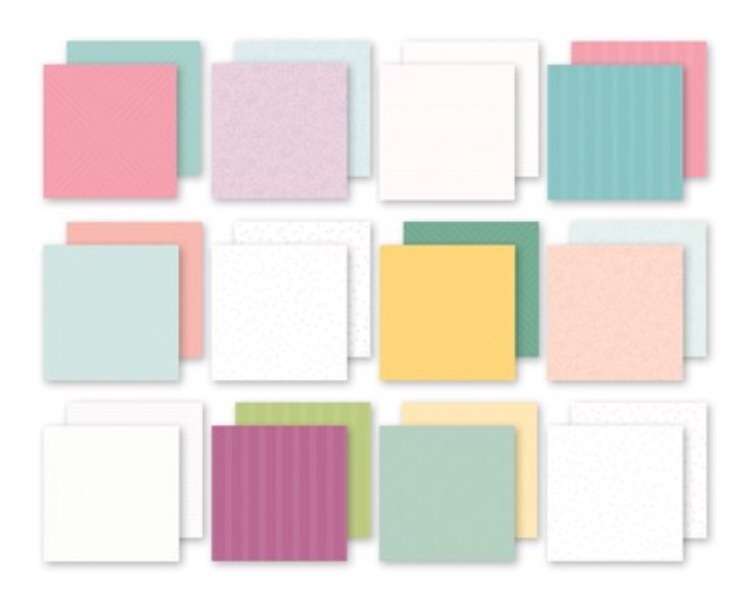 If that’s how your paper originally became a scrap, use the space that’s still left for photo mats, journaling mats, borders, stamping and/or punching smaller items. You’ll likely have to trim off the pieces of paper that were cut, but you’ll be surprised to see how much paper is still left if you trim them down. Think outside the box. What can you do with the paper you have left after using your Cricut? Alternatively, don’t be afraid to throw your smaller scraps through your Cricut, too. It is possible to use them, you’ll just have to make the items you’re cutting smaller. Sometimes, that takes a bit of trial and error, so maybe use a scrap of paper that you don’t care much about to get the sizing correct. Then, use your favourite paper to cut the final item! I cut my title using my Cricut. I used both White Daisy and Willow card stock to create the title. Mat your photos with your scraps. Both patterned papers and card stock works to mat your photos. If you got really creative, you could also use scrap washi tape, shimmer tape, zip strips, stamps, or twine will work, as well! All of the suggestions I listed above are ways that I use up my scrap paper stash. Most often, I stamp on my scraps and use them as photo mats and journaling spots on my layouts, but its not limited to just that. There’s no right or wrong, and the sky’s the limit. Get yourself outside the box, and do something different. Also, the suggestions I listed are probably just the tip of the iceberg. What are some ways you use up your scraps? I’d love to hear how you use them up! What did you think of this blog post? I’d love to hear! Share what you thought in the comments below.